Did you know that there are substantive differences between residential roofs versus commercial roofs or did you think they were one and the same? The most-notable difference, besides the medium, or type of roofing material utilized for the particular roof, is that a residential room is usually of the steep-slope variety and a business, or commercial roof, is usually flat or on a very low slope. Sometimes a homeowner chooses a particular roof for its aesthetic value, like slate or cedar shake, wherein a business owner seeks to have a roof which will be durable and service the building for many years without issue. There are other differences as well, for example, if you have a business now located in a building which was formerly zoned as residential. But, for purposes of this post, we shall concentrate on the types of roofs used for residential and commercial, and then commercial roofs only. It would behoove you, as the owner of a business, to employ a trusted commercial roofer to periodically inspect your roof’s integrity. Missing shingles due to high winds or water damage due to heavy rains, will not only wreak havoc with the shingles, but is sure to seep down into the wood and membrane underneath those shingles, and invite damage such as wood rot, mold and worst of all… damage to the ceiling. During the Winter of 2014-2015 many businesses in Massachusetts incurred damage after the roof collapsed under the weight of the snow. Luckily, in sunny and warm Irvine, California, there is no such worry as snow damage, but pelting, non-stop rain can do much damage as well. Roof damage due to natural disasters is one of the number one reasons for property loss for businesses, as well as residences. A reliable and reputable commercial roofer can climb to your rooftop and take a look-see several times a year, perhaps once each season, to check the roof thoroughly and hopefully keep future damage at bay. Many factors determine what type of roof is to be placed on a commercial building – unlike a residential building; a roof is not installed strictly for aesthetic reasons. An industrial building may have multiple ventilation stacks, chimneys, extensive piping, pumps and/or large, overworked HVAC systems, all which may be running 24/7 and which could potentially cause weak points in the roof. These weak points would be at the mercy of Mother Nature, especially during high winds and heavy rains. Because of the nature of the typical commercial building’s low- slope or flat-style roofs, they sustain more weather-related damage than a steep-slope residential roof, where heavy water will generally run off. Often, damage is quick and spreads along on a flat surface, so that, without immediate repair, the roof may require extensive portions of new roofing materials to be installed and/or replaced in its entirety. The best advice, besides routine inspections of the roof, is to hire a reputable commercial roofing contractor in Irvine who specializes in commercial roof installation. That way you know you will have an expert who will use top-quality roofing materials and ensure those materials are properly installed to thwart weather damage of any kind down the road. Depending on the size of the building, a new roof installation could be time-consuming, as well as costly. It is a major investment for the business owner, thus, every precaution should be taken to ensure the project is done with utmost care. An experienced commercial roofer will consult with the business owners so that they are on the same page as far as roofing materials which will be used, as well as the underlying integrity of the roof itself. Several components play a part in the selection of the particular roofing materials to be used. Of course, the primary component is where the building is located. For California, special care would be in play to select materials that will not attract the sun’s rays which will eventually fade, and destroy the roof color, not to mention acting as a magnet to heat up the roof, and subsequently the building beneath it. This could be cost-prohibitive in a large facility which requires air-conditioning. Weather and location in the country or state having been the biggest factor, the next, most-important component is the slope of the roof. As mentioned previously, most commercial buildings have a flat roof, with the small exception of businesses being converted from prior residences or historic homes where it would not be feasible to have a traditional commercial roof without destroying the original home’s aesthetic value. The classifications of a commercial building sometimes need a little wiggle room. For example, sometimes a building, such as an apartment, while technically considered a “residence”, it is considered a commercial type of building, and would have a typical commercial-type flat roof, thus it would utilize flat-roof-type materials. • Asphalt shingles. This is the #1 type of shingle used for both residential and commercial buildings. This type of shingle is comprised of organic material, wood fibers or fiberglass and is very durable, having a lifespan of some 20 to 30 years. There are basic shingles or laminated shingles, and the latter are available in a wide variety of colors and textures which mimic more expensive shingles like the wooden shakes or slate tiles. Laminated shingles last even longer than ordinary asphalt shingles – between 25 and 50 years. • Slate Shingles. While aesthetically pleasing to look at and prized for their durability (if properly installed, a slate roof may last as long as 100 years), they are more commonly used for residential roofs due their cost. However, if the building is not over-large and the slate roof can be installed (depending on the type of underlying structure), the cost may ultimately be as much as 400% higher than more commonly used commercial roofing mediums. • Wood Shakes. Also prized for their aesthetic value, they are typically used for residential purposes, but may be installed for commercial purposes as well. Wood shake roofs are usually made of treated wood, such as cedar and the materials and installation are pricey. They may last as long as 30 years. In some parts of the state of California, the building code will not permit installation of this medium due to wild fire risk; in other areas of the state, a special fire retardant may be applied prior to installation of the wooden shingles. • Metal roof. At one time, metal roofs were mostly used for low-slope roofs, but they are gaining popularity for residential steep-slope roofs as well as in a commercial setting. They are prized for their durability as well as being maintenance free, and their price is moderate… halfway between asphalt shingles and the pricier roofing materials. In a warm-weather state the use of white or light-colored metal roofs is very wise since it has excellent light-reflecting abilities and is an attractive-looking roof on its own. You may even consider purchasing a metal roof designed to resemble cedar shake, regular shingles or concrete tile. Metal roofs are a good option and a wise investment because their lifespan is between 30 to 50 years, and metal roofs made of copper, while pricier, can last up to 100 years! While metal roofs can withstand extreme weather, they may dent in hailstorms; however, a new granulated coating now is available which prevents hailstorm damage. • Ethylene Propylene Diene Monomer (EPDM). The most-common medium for low-slope roofs is a rubberized material called “EPDM”. It is comprised of ethylene and propylene and is the least-expensive roofing material, easy to work with and cleaner than other mediums. Depending on environmental conditions, EPDM is good for 12 to 25 years. • Single-Ply Roofing. 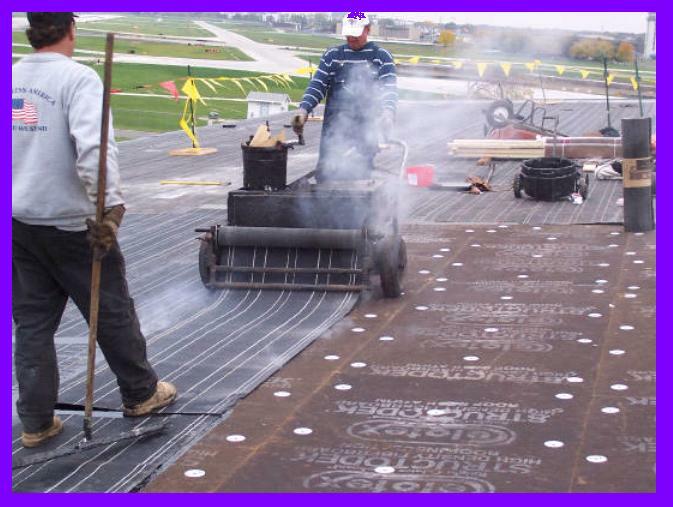 Another popular commercial roofing medium is roofing membrane, a/k/a “single ply”. These are synthetic sheets of membrane-like materials, used predominantly for flat roofs or very low-slope roofs. The membrane is attached with a special adhesive to help the sheets adhere and keep the roof flat and smooth. • Built-Up Roof (BUR). As the name suggests, the installation of a built-up roof for a commercial building is created by layering bitumen-saturated felt, coated felt, polyester felt, or other fabrics onto the underlying surface and after completion of this process, protectants such as gravel or slag granules are applied for protection against the elements.